I feel like playing Mario Brothers after doing this manicure – am I dating myself? 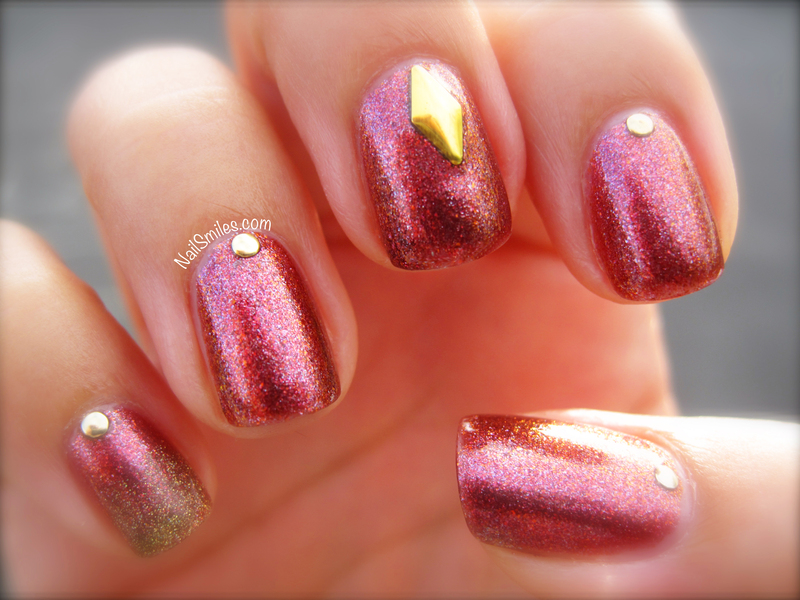 This design makes me think of princesses, specifically Princess Peach; obviously the pinkish color contributes to the thought, but I think the gold studs (especially the diamond shaped stud) actually remind me of a crown. What is Princess Peach doing in this photo?! 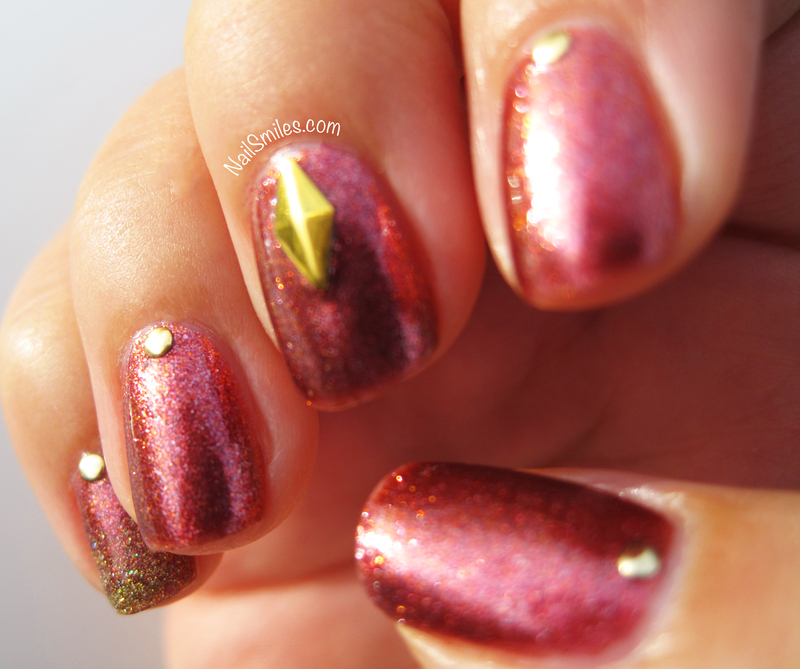 This manicure is done with Covergirl’s Timeless Rubies polish. This is the first time I’ve bought their stuff and I’d say the color itself is great. I don’t think these pictures do the color justice and it was such a busy week that I didn’t make the time to shoot photos in different lighting for the best effect (these photos were actually taken in the parking lot of my work). It’s a combination of a shimmery look, a bit metallic and a bit of a duochrome as well. Depending on the lighting orange and gold pops out from the pink, and even a bit of grayish blue? The brush was fine and the polish was thin enough to control the two coats I did; not sure if a third coat would make much of a difference. I didn’t get any big chunks chipping off, but the tips did start to wear pretty fast within the first few days. 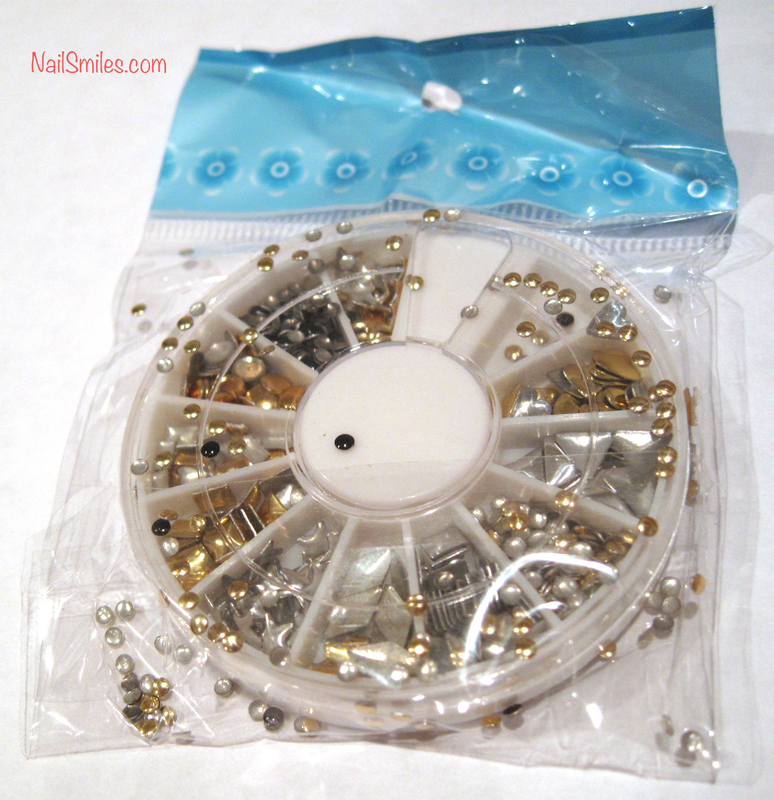 The studs I used are from BornPrettyStore.com and they’re a pretty good deal for over 200 pieces. They have a bunch of other really cute stud options including a new set of colored dots. When my set arrived it was a bit messed up from the transport so the tiny dots were everywhere (see below), but it actually only took a few minutes to fix and organize. After almost a full week of wear all the studs are still stuck to my nails and they don’t get caught on anything. I was impressed with how well the larger diamond shaped studs curved to fit my nail (which I’ve found can be an issue when attaching larger accessories). I’m excited to play around with the other shapes and get some creative designs! 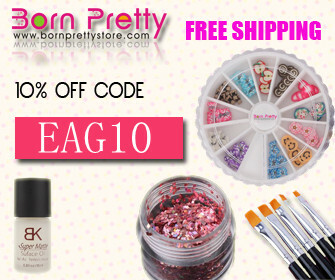 Use code EAG10 for 10% off an order at their online store! My friend Jody purchased some new polishes last week and requested I give her a doticure with them. How could I say no? 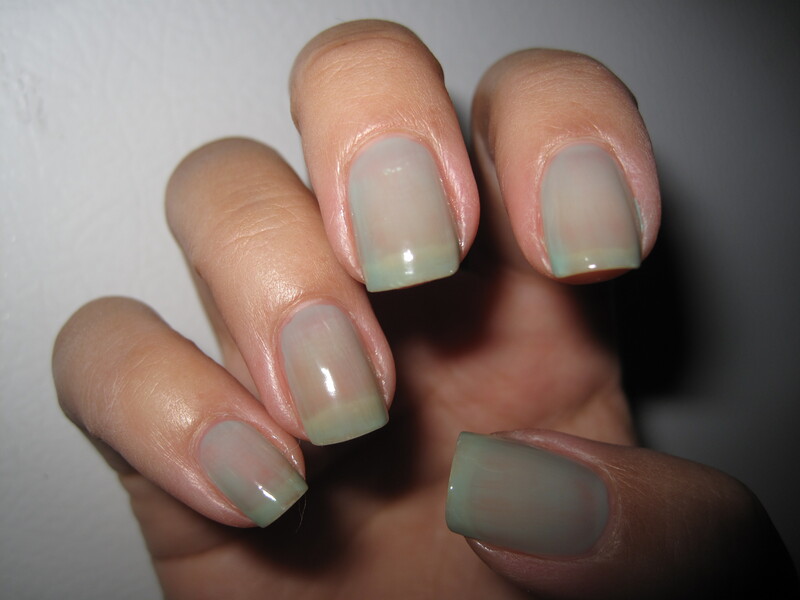 On a side note, this may be my signature style manicure since I’ve had it requested by multiple people. It was time well spent because we got to hang out and while I was at her house I learned about an organic farm festival happening the following day, which I ended up going to. 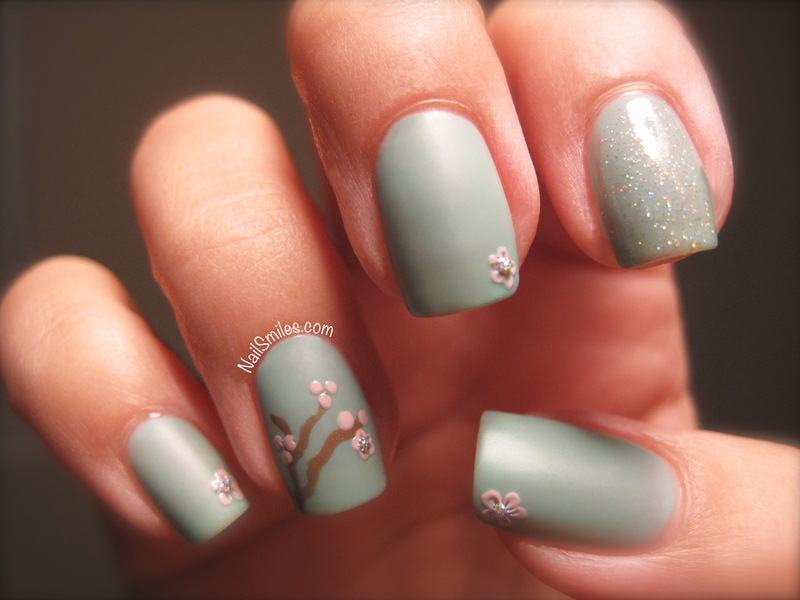 I also found out Jody has a pear tree she doesn’t pick; I think pears for manicures is a fair exchange :). 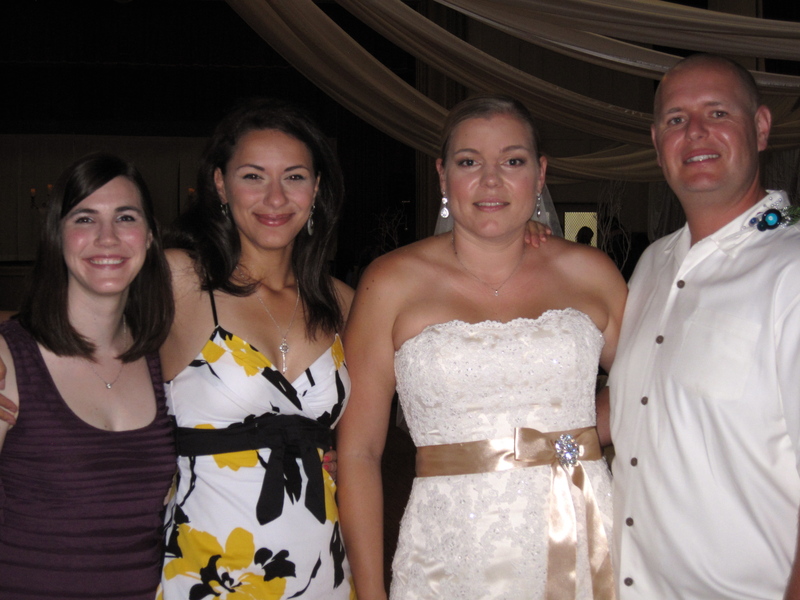 This was the first time I have used the Maybelline Color Show brand. The brushes were workable and the colors are very current. The gray definitely needs two coats to look good and you can see in the photo near the cuticles how it looks if there is only one coat. The mint and green dots were opaque with one application and I think the glitters help tie the whole thing together. I love this color combo and because we did the right prep her nails lasted all week! I have rainbows on my fingers; it’s a good day. 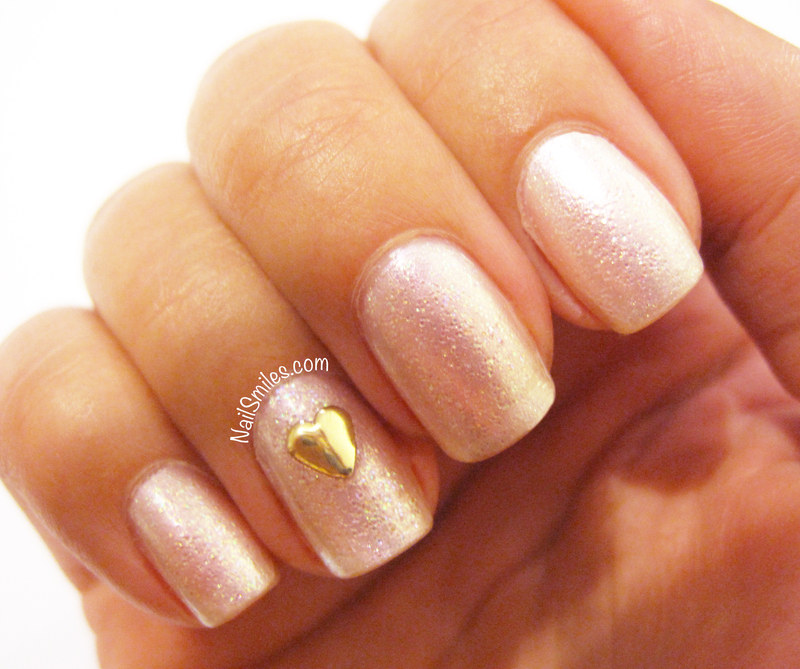 This lovely shimmery manicure is made possible by BornPrettyStore.com’s Holographic Polish Effect #9, and it’s a big wowwy wah woo for me. (Reminder use code EAG10 for 10% discount on their site). 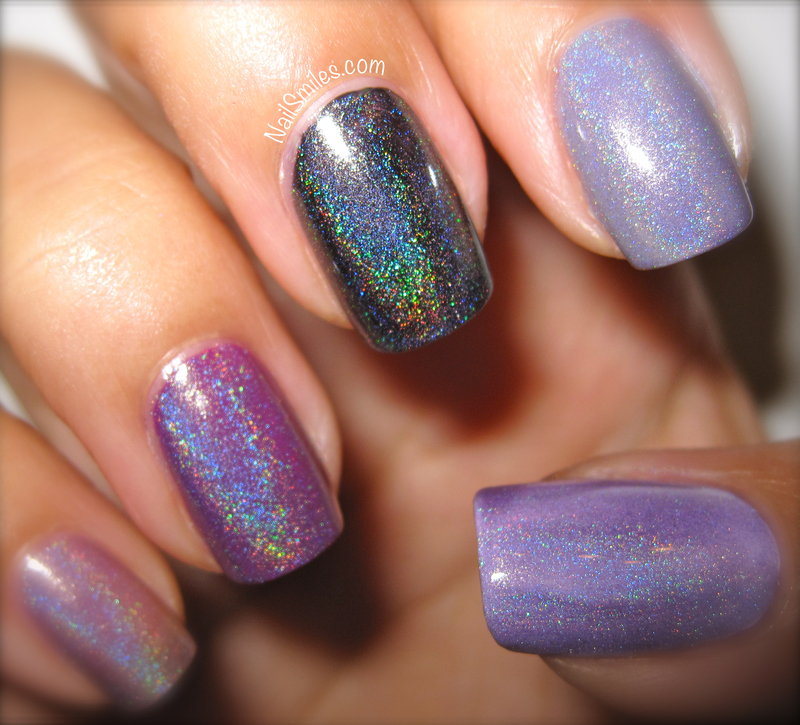 I did a different base color on each of my nails and then painted one and two coats of the holographic polish on top. I can’t decide how I like it more, because both styles are equally pretty. My thumb has a white base, pointer has gray, middle finger has black, ring finger has fuchsia and my pinky has no base, just the holo polish. At one coat the base colors show through quite nicely; the black really makes the rainbow shimmer from the polish pop and the white really highlights the purple hue, but really every color I tried worked with this holographic polish. At two coats it is pretty opaque and only a bit of the base is even apparent. I didn’t try three coats, but I’m sure at three coats the bases would not show at all. It’s a small bottle, but I’m sure it would still last and the brush was very flexible and soft, plus a good workable size. The polish itself is not thick, went on really smooth, and dried quickly. It also wasn’t very smelly, which is always a plus! I completely recommend this polish because I can’t stop staring at my nails!! Disclaimer: I received the holographic polish as a free promotion, however all opinions expressed are my own! From the time I was a little girl going into Hello Kitty stores to my adult life watching anime and visiting Japan I have always loved the kawaii (meaning cute in Japanese) culture and characters. 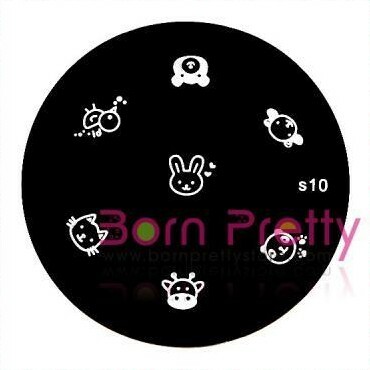 I recently got the S10 “Cute Rabbit Cat Animal Design Nail Art Stamp Template” from BornPrettyStore.com and using this adorable stamping plate was high on my priority list after a week long trip to visit my dad in Canada… it’s true, I was suffering some nail art withdrawals from being away :D.
The stamping plate has 7 different little characters on it – bunny, kitty, teddy bear, chick, panda, giraffe and the seventh is what I like to call the “mystery animal”; I think it’s a sheep? My confusion lies in the fact that what would appear to be horns and ears look more like two sets of ears – I think it’s a cute character either way, but would love to hear your guesses! I started out with a different color on each nail, all topped with the beautiful, glittery, pearlescent Ulta Diva (I love putting this over a bunch of different colored nails because it ties them all together and makes them look a little more pastel). 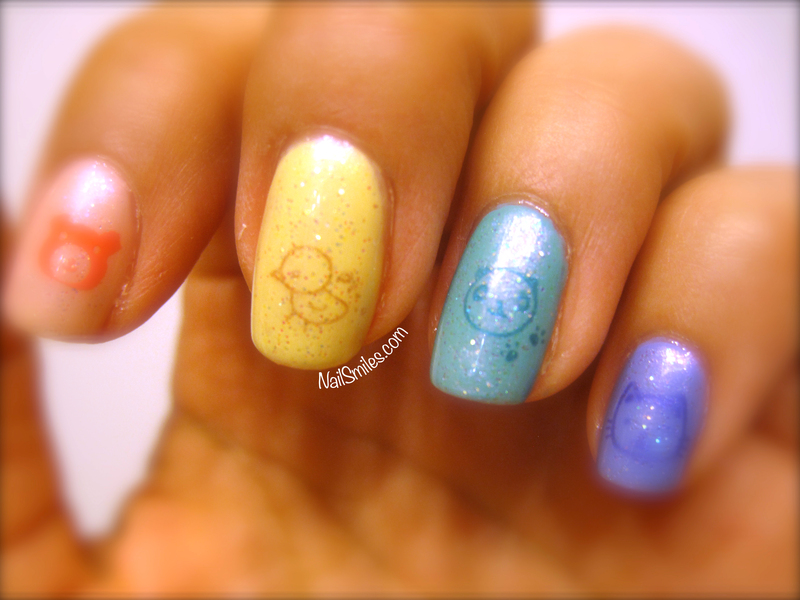 Each nail is also stamped with a different color, none of them are made specifically for stamping. 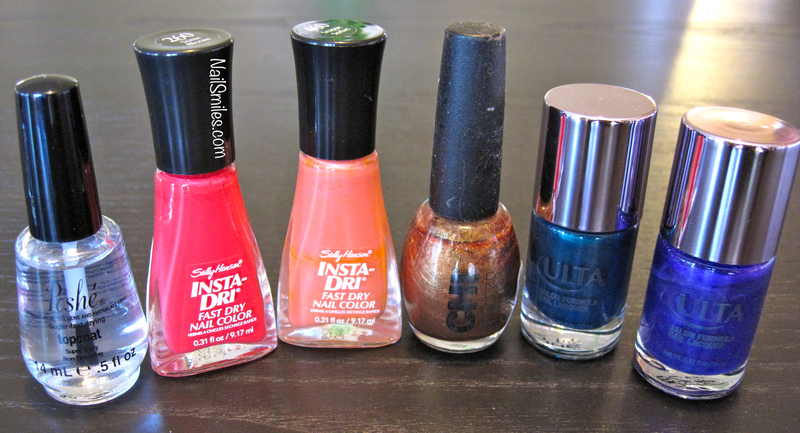 I used a combination of thick quick-dry polishes and thinner shimmers to see how both turned out. 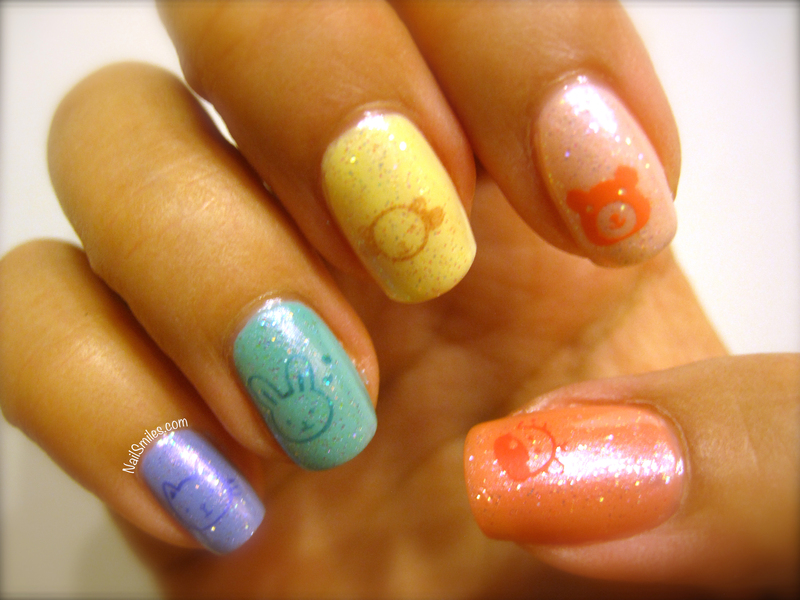 The thin outline images on the plate (the chick, bunny, kitty, panda and mystery animal sheep thing) seemed to work better with the thin nail polishes. When I tried to use the insta-dri polishes on the thin outline images they didn’t transfer well; I think this is because the lines are so fine that the thick polish dried almost instantly. The Insta-Dri polish worked great on the bear (which doesn’t have thin lines) and pretty well on the giraffe where there are big spaces for polish to fill. Overall I’m really pleased with the plate and for 99 cents and free shipping I don’t think it can be beat! On a side note I’m really happy that I picked up the Poshe Top Coat, it’s very similar to Seche Vite, but without the toulene. It didn’t smear the polish underneath, not much shrinkage and no chipping as of day 3. Much better than the Orly Top Coat I recently purchased! If you get anything from their online store use the code EAG10 for a 10% discount. As an exciting bonus if 10 people place orders with that code BornPrettyStore will sponsor a free giveaway contest for my website! 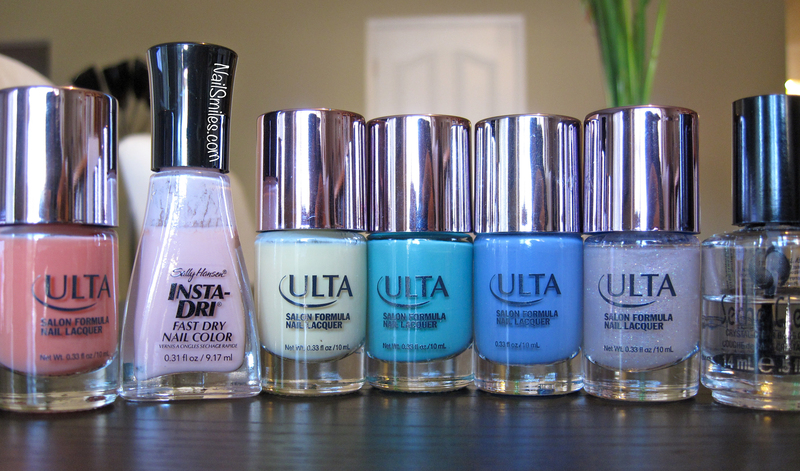 If it’s for free, it’s for me :D.
Coming up next will be holographic polish and nail stud reviews! Disclaimer: I received the S10 stamping plate as a free promotion, however all opinions expressed are my own!